So much thought goes into what dress to wear on your wedding day. Since you were a little girl, you played dress up in costume dresses, stumbling around in your mom’s oversized high heels — dreaming of what you will one day look like when you marry your prince. You may have laughed at your grandmother’s plain high-neck dress with sleeves that puffed out at the elbow and your mom’s tight-fitting dress with puffy shoulder sleeves — and stared in amazement at how beautiful the bride always looked at the weddings you attended growing up. Each year, bridal wear trends seem to change, and as you look back over the decades what was once trendy becomes the first thing listed in the ‘What Not To Wear’ rule book — and gives younger generations a good laugh. 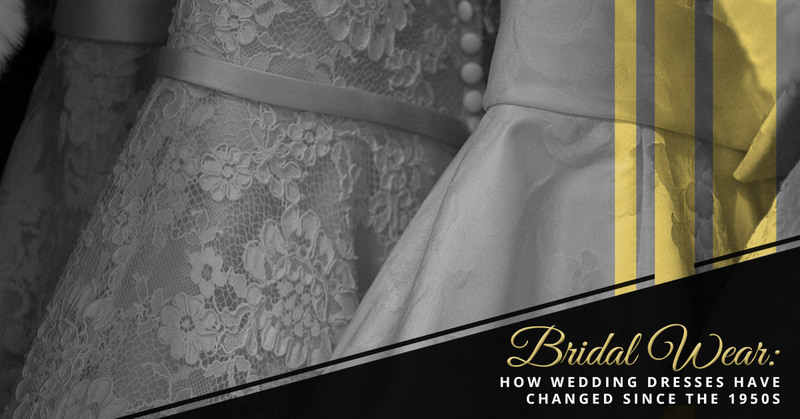 In today’s blog, we are going to explore wedding dresses throughout the decades and how bridal wear fashion trends have changed since the 1950s. During the 1950s, the bridal wear trends were modest and sophisticated. Ballerina-length dresses were extremely popular and often featured a sweetheart neckline and were covered in lace. Due to the length of the dress, brides carefully selected their shoes and for the utmost elegance and style, brides also wore gloves to match their wedding dress. In the 1950s, gloves were a must-have bridal wear accessory, as gloves were worn when a woman wanted to look extremely glamorous and fashionable or when they were attending a formal event, such as church or weddings. Brides wore long or short gloves made out of tulle, lace, and satin. During this time period, mid-calf length wedding dresses and short veils became popular — inspired by Audrey Hepburn. Since shorter hemlines were popular during this time, everyone paid special attention to the bride’s shoes. Kitten and Cuban heels were a popular choice for brides. The 1960s, also known as the Space Age, was dominated by change, high empire waist dresses, iconic headwear, and the wildflower of the decade — daisies — inspired by the rise of hippies during this time period. During the 1960s, empire waist wedding dresses were the most popular. This high-waisted cut made women look taller and more slim. The hemline became taller, as mini skirt dresses arose. During this time period, pillbox hats and tiaras were commonly worn with veils — inspired by Princess Margaret and Jacqueline Kennedy. During the “Space Age” decade, a wedding wasn’t complete without daisies. These wildflowers were incorporated into bride’s small bouquets and even their dress. During the 1970s, bohemian styles conquered bridal wear trends. The natural look was en vogue and flowy, ruffled dresses dominated bridal fashion. During this era, you would also find brides walking down the aisle barefoot, as garden, outdoor weddings were popular. During the 1970s, the trend was long, flowy, and layered. Double-knitted wedding dresses became increasingly popular. During this era, your sleeves were the most important part of your look. Long, puffy sleeves were all the rage — inspired by Princess Anne. In the 1970s, many wedding dresses featured ruffles above the hemline — inspired by the Bohemian bridal wear trend that dominated the era. The 1980s was a decade of everything grand and oversized. From big hair to cathedral veils, the more dramatic and “over the top” the bridal wear, the better. That’s why during this era full-length cathedral trains, padded shoulders, and high mandarin collared necklines were sought-after. During the 1980s, the longer the train, the better. Full-length veils were also frequently paired with long cathedral trains — perfect for a ballroom! Shoulder pads were a must! During this decade, puffy, over-the-top shoulders were extremely popular to match the permed, teased, big hair that was also trending during the 80s. During this time period, the more dramatic the look the better — even when it came to collars. High-neck mandarin collars were frequently incorporated into wedding dress designs during this noteworthy era. Dissimilar to the era before it, the 1990s bridal wear trends were all about simplicity. Due to the fact that more brides and grooms were opting for destination weddings over traditional church weddings, more fitted, less detailed dresses took over bridal fashion and more simple veils began to come back into style. Unlike the dramatic era before, 90’s bridal trends were all about simplicity. During this era, embellishments such as lace and beading began to fade away. During the 1990s, destination weddings became a popular trend. For that reason, brides needed to easily transport their wedding dresses and fitted wedding dresses rose in popularity. Unlike the pillbox hats and tiaras of the past, headband veils became the new veil accessory of the decade. During the 2000s, bridal wear fashion trends were inspired by shine and bling. Destination weddings were still trending and silk, strapless wedding dresses gained popularity. Detailing also rose in popularity once again and many brides began adding belts to their wedding dresses for more of an individualized look. The most popular wedding dress style during the 2000s was the A-line dress that was more fitted at the hips. Silk also became a popular fabric for wedding dresses during this time period. 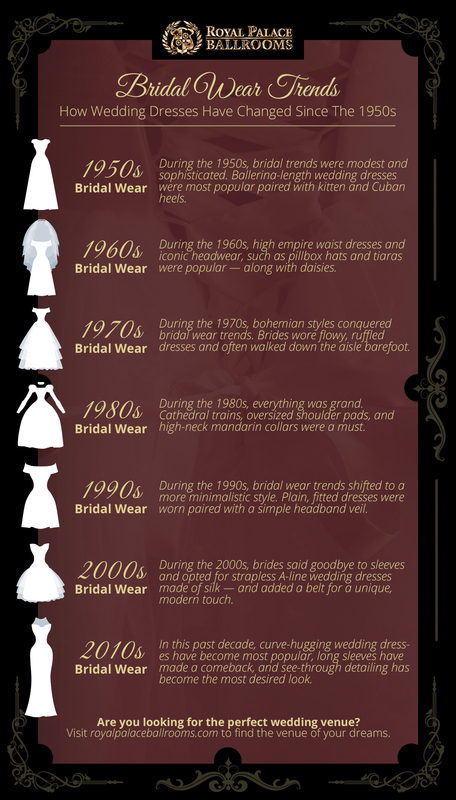 Unlike in the past where puffy sleeves were an absolute must, brides put the sleeves in the past and went strapless. During this era, a simple bridal look was still in style, however, brides started adding an individual touch to their wedding dresses by adding belts. While the 2010s era is nearing its end, this decade has been characterized by wedding dresses that show off all of the bride’s curves and feature one-of-a-kind details. Kate Middleton seems to be the bridal wear style icon of the decade, revolutionizing long sleeves and originating the see-through, textured detailing and natural bridal look. Unlike in the past where brides wore more modest and loose-fitting bridal gowns, today brides are opting for curve-hugging wedding dresses, such as mermaid gowns. While strapless dresses were all the rage in the 2000s, lace, long sleeves have become increasingly popular thanks to Kate Middleton. Since her marriage to Prince William in 2011, long sleeve wedding dresses have been one of the most desired wedding dress styles of the decade. Today, beaded, crystal, and see-through detailing has become extremely popular across all styles of wedding dresses. Today, individualized weddings and bridal wear are becoming more and more popular. Everyone wants their wedding to be different and unique and they want to stand out from the crowd — which means bridal wear is becoming more and more unconventional and unlike anything we’ve seen before in the past. Currently, we are seeing a rise in wedding jumpsuits, princess capes, off-the-shoulder sleeves, and more. We can only imagine the bridal trends of the 2020s are going to be exclusive. Whether you choose to bring back unique styles of the past and wear your mother’s wedding dress or purchase the most fashionable wedding dress to date, our staff at Royal Palace Ballrooms in Hialeah, Florida knows you are going to look and feel like the princess you always dreamed of being on your wedding day. Make your wedding day even more like the one you imagined in your dreams by having your wedding and ceremony at our one-of-a-kind venue. At the Royal Palace Ballrooms, we are here to tailor to your needs. Contact us today to learn more about our blissful packages.